I finally managed to spend some time on the ICE tandem today. The 60mm Big Apple on the back is too big for mudguards which is a bit annoying, especially as this is the second time I've gone a bought a tyre too wide for its intended frame. I haven't bought the new chains yet and I fear that its going to be an expensive bike to re-chain. I know that the Nazca webshop sells 9 speed KMC chain off the roll which is probably the best way to buy for a bent, I'm open to other suggestions of where to buy though. 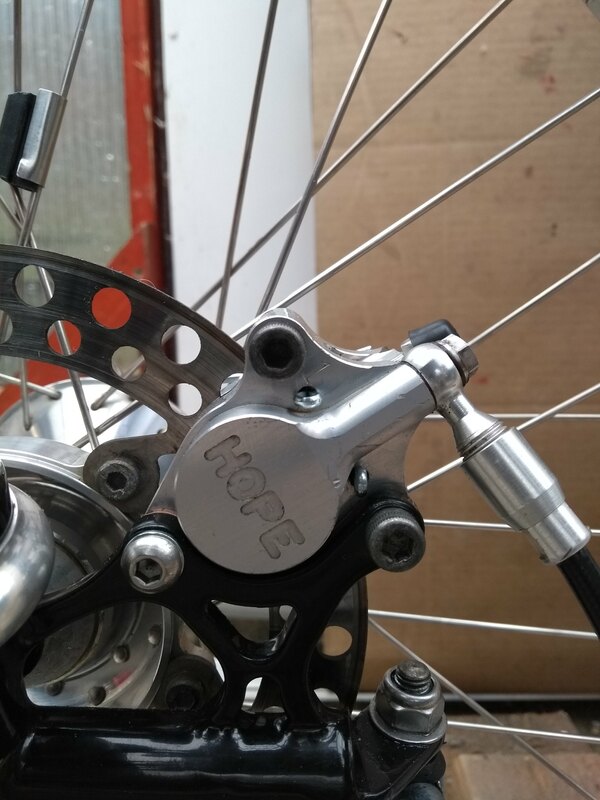 The ICE tandem is fitted with Hope Closed 2 brakes, the mounts for which are not the current 51mm IS standard. Does anyone know whether it is possible to update these brakes? 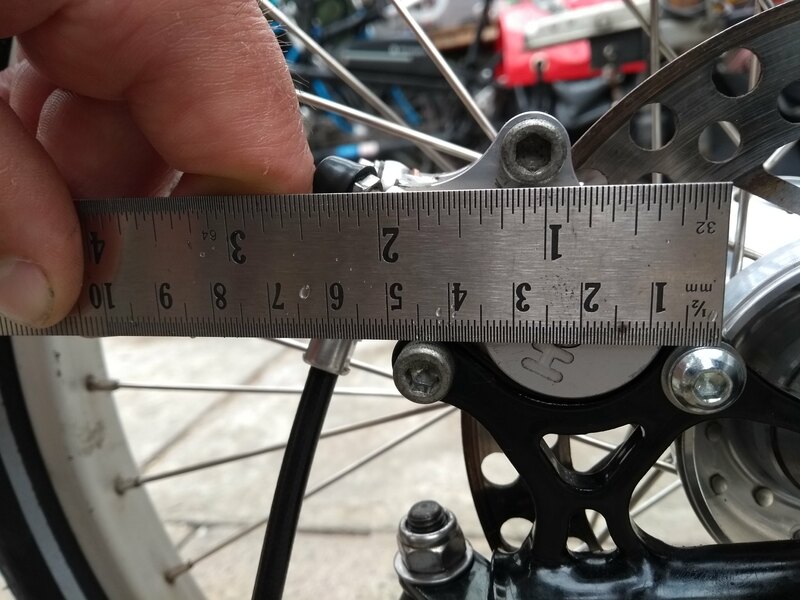 Is there a method/adapter that would allow me to fit 51mm or post mount caliper? Not wishing to pee on your bonfire but that Trek part is specifically to mount a modern 'standard' caliper to the rear LH dropout on Trek and Gary Fisher frames. 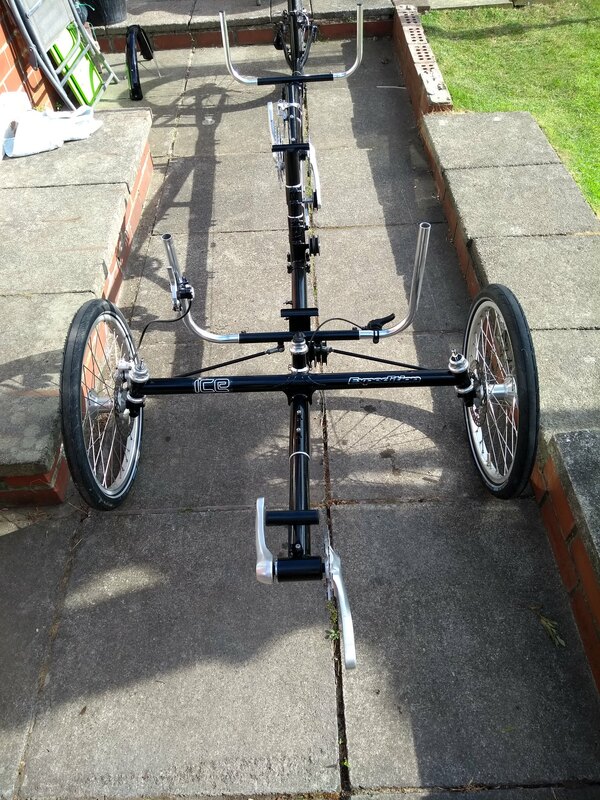 If it fits the mountings on the trike I can't see how it would fit both sides as the Hope calipers appear to be a handed pair. Can ICE help? I've had very little dealings with them aside from the conversion of Cycleman's trike but found them approachable and helpful. I haven't contacted ICE about this yet but you are quite correct, they are super helpful. They had a good rummage through some old storage creates and managed to find me some original details for the trike recently. I may not change the old Hope C2 brakes, just depends on whether I can get them functioning properly. If not I'm inclined to fit BB7's, I've never had much difficulty with those. Indeed. They met the primary 45 -> 51 requirement - whether it's possible is down to empirical experiments. I've not given up on the Hope C2's yet, just investigating options. I can't do anything until next week as I'm away on the annual end of term lads and dads camping weekend. Just updating this thread with info that Chain Reaction are currently selling off KMC X9-93 chains at £8.99 each. 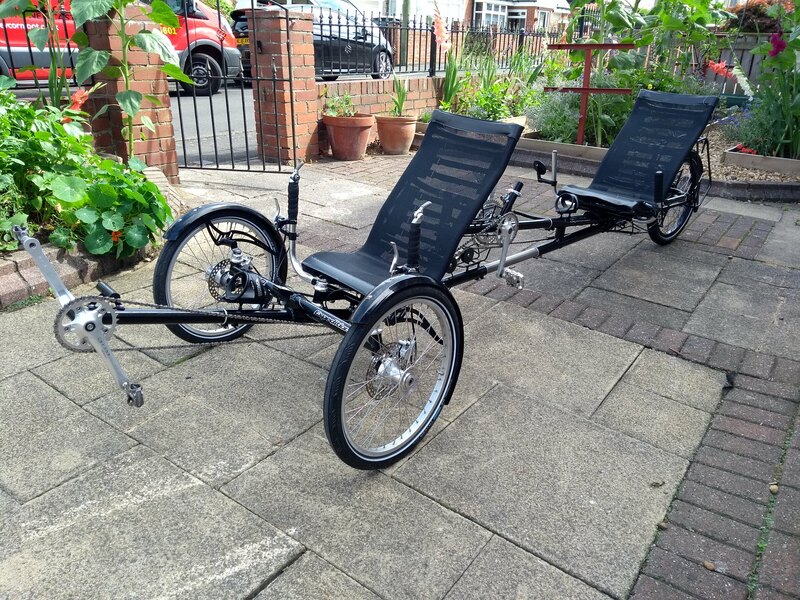 At that price and with the amount of recumbents and tandems in our family I've bought 8. Re Hope. Make sure you can get the seals before stripping. Lots of early Hope stuff is NLA. Got them all in hand. I'd agree with you both completely on that, not the easiest brakes to service. I changed all the seals in the levers without too much difficulty but one of the piston seals was a right ba^%£rd. Very strange setup - it has a 4-way junction box for the hoses, so either lever applies both brakes, or both levers apply both brakes, but with only 1/2 the pull of a single lever. Weird feeling as the unused lever hardens/softens up as you pull/release the other, but l expect I’ll get used to it in time - or I'll rip it out, being a single point of fail that could disable primary(*) braking entirely. They sound a bit more complicated than the ones that I've been dealing with. Fortunately I don't have the 4 way JB you describe, just the normal one lever / one caliper arrangement. 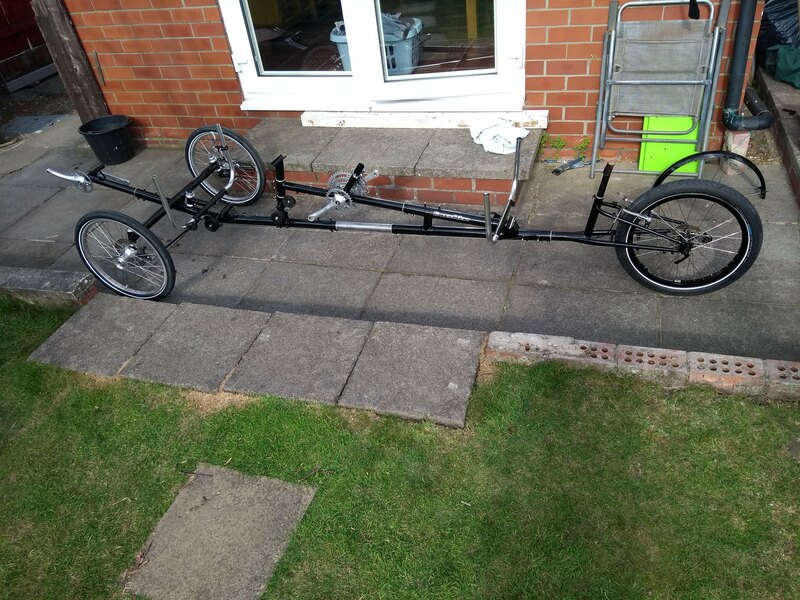 The trike is pretty much all done now, first test ride was absolutely fine with the exception of a little bit of slippage on the cassette. I really should have bought a new one to go with the new chains but it will be easy to sort out next weekend. I've a vague recollection of seeing that junction box thingy on a very early ICE machine – one of the first they built after taking over from Peter Ross - but I don't think they pursued it for long. One lever driving two brakes via such a junction box seems eminently useful. Two levers just seems like an additional point of failure for no obvious benefit. The Tektro Auriga Twin's are one lever feeding two brakes. I'm assuming the lever has been tweaked to pump twice the oil for a standard pull. Otherwise the braking would be poor/weak. I use them on my Sprint. I think the reason for the X joint is to stay strictly within the letter of the law that both brakes on a single axle must be linked and work together. That's how it's worded for motor vehicles. Without a tweaked lever then you need 2 levers to feed twin brakes. I'm not sure for trikes if that law is applicable, has been changed or if it's just ignored. Here she's just about finished. Just need some grips for the stoker and a couple of new bits of foam for the seat bottoms. If anyone knows of where I can easily obtain such foam please post it. The high density stuff is easy to get hold of but I'm drawing a blank on the low density low water absorbancy foam used on recumbent seats. I'll probably drop ICE a line. What size are you after ?? One idea is to look at a Ventasit cushion as they don't hold water. Something like a 16" square pad may well work. you know I actually haven't got the slightest idea what size I need, I'm away from home until Thursday evening and didn't measure before I left. Bad planning or what. 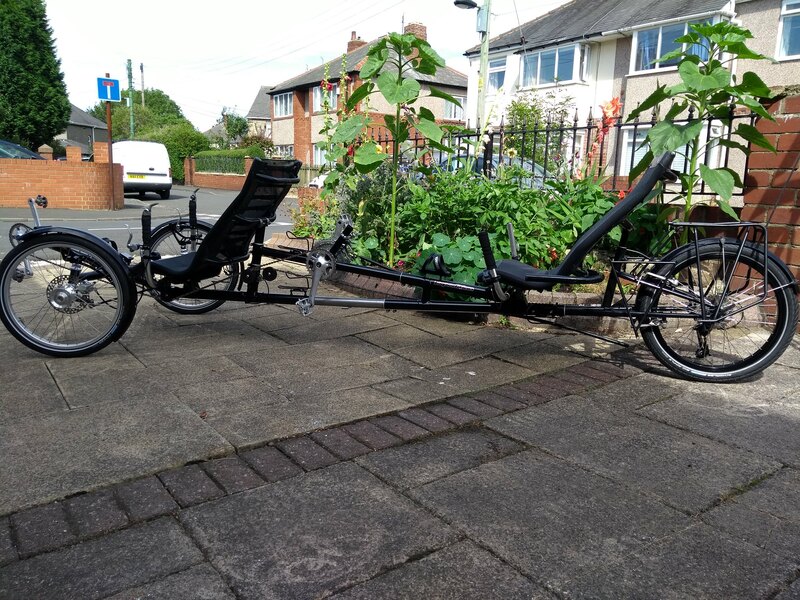 I could see the point on a non-tandem trike, that way you could brake both front wheels with either hand whilst indicating with the other ... However for a tandem where you have a stoker for hand signalling purposes (I'm told they also sometimes contribute to forward motion) it does seem a bit redundant. Fair point, although ICE trikes are normally quite polite about one-sided braking, so it's not a problem in practice. 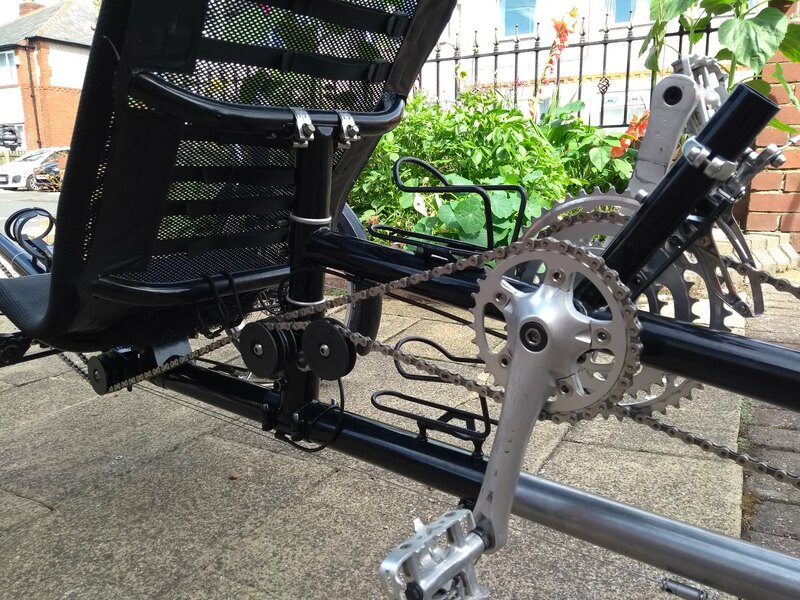 I did fit a left-hand lever to operate the rear brake on barakta's (which is configured for single-handed operation on the right), purely for when I'm using it for trailer-hauling duty in town. Not being able to brake while indicating right with a heavy load was rather alarming. The one on barkata's seat (circa 2011, looks like a similar design) is 330mm × 255mm × 45mm, with corners cut off to make it trapeziod. Seems to be a low-density pond filter style foam, of the type some recumbent riders would use to pad hardshell seats before Ventisit was invented. I'm not sure what it actually contributes to the seating experience - presumably just splash protection from below in a way that can readily dry out. On which basis the exact material probably isn't that critical, but I'd suggest Ventisit is probably a bit too open (and quite expensive).